Siam@Siam. Design hotel next to the Jim Thompson House with shopping facilities in walking distance. You can book it here. Nuovo City Hotel. Convenient hotel close to the backpacker road Khaosan. Take a room with windows. You can book it here. Aetas Lumpini. Upper class hotel at Lumpini Boxing Stadium, very close to metro station. You can book it here. Peninsula Bangkok. Luxurious hotel at the quieter Western side of the Chao Praya. It has beautiful little shuttle boats to cross the river and the hotel facilities are very appealing. You can book it here. Or Tor Kor Market. Great fresh market (next to Chatuchak Weekend market) for tasting various Thai dishes and do some shopping for fruits etc. Metro Station Kamphaeng Phet. The China House. Original and creative Chinese dining in an atmospheric interior. It is a restaurant of the Mandarin Oriental Hotel and the service is very attentive. My Darling, 323 Thanon Rambuttri. Get grilled chicken and fish at the busy Rambuttri Road. Din Tai Fung, 7th floor of Central World Shopping Centre, Rajdamri Road, Patumwan. Great Chinese Dim Sum, you just tick on a list what you want to try. The branches in Hongkong even have a Michelin Star. Aka, Central World Shopping Centre, Rajdamri Road, Patumwan. Tasty Japanese table barbecue. Silom Shopping Mall also has a big food court in the basement. Metro Station Silom. Take a tour through the beautiful Jim Thompson House and its garden. 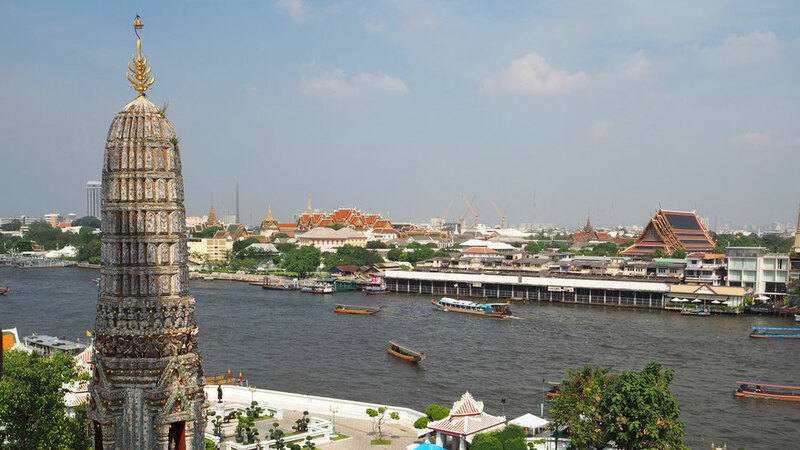 Visit Ayutthaya, a UNESCO World Heritage Site North of Bangkok, as a half-day trip. Walk along the small canals known as Khlongs. Take a stroll through Chinatown (Yaowarat and Sampeng Road) and Little India (Phahurat). Central World Shopping Centre is Bangkok‘s largest shopping mall followed by the luxurious Siam Paragon. The MBK Center is more like a huge indoor market on different floors. Universal Tailors. Have a shirt or suit tailored in short time. Moon Bar. On top of the slim building of the Banyan Tree Hotel. Food is said to be costly but a drink on the former helicopter platform is recommendable.